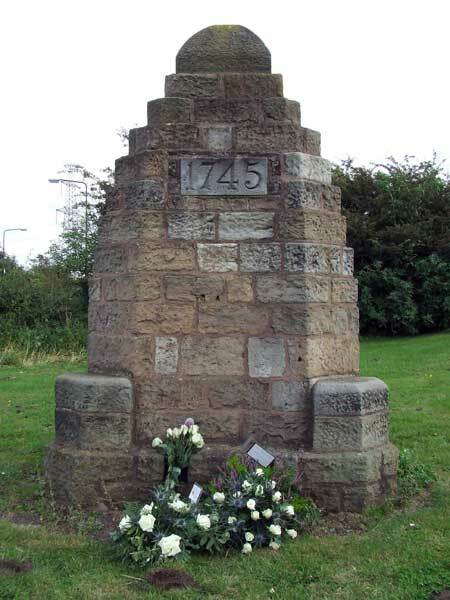 Hanoverian General Cope landed at Dunbar on September 17, 1745. 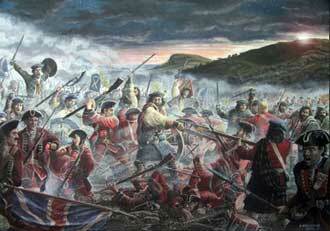 Along with approximately 2,500 troops he marched toward Edinburgh. With forces somewhat equal in number to the Jacobites, Cope decided to make a stand at Prestonpans and wait for Prince Charles Edward Stuart, who he knew would inevitably march to meet him in battle. The Hanoverian defensive position was thought to be ideal, with two stone walls on their right, a bog on their left, the sea behind and a deep moat-like ditch in front. In addition to Cope's well armed foot soldiers and dragoons were six 1 1/2 pounder galloper guns and six small mortars. 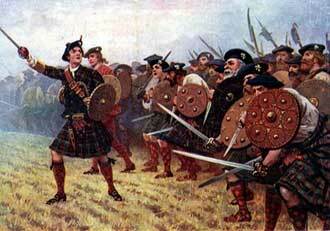 Considering the Highlander's "poor" weapons (mismatched guns, broadswords, Lochaber axes, pitchforks...) and their lack of artillery, the English Commander was quite confident. The Jacobites came within sight of Cope's men by mid-afternoon, September 20 and paused to reconnoiter their offense and survey the area. Quartermaster and Adjutant-General John William O'Sullivan, a man neither respected nor liked by the Highland chiefs, sent a contingent of Camerons to the Tranent churchyard, at the village's northwestern extremity. Without delay they were observed by Cope's men, who used two of their 1 1/2 pounder guns to bombard them, wounding some. At this point Donald Cameron of Lochiel, XIX Captain and Chief of Clan Cameron became enraged that his men were being risked so and asked O'Sullivan's rival, the well thought of Lord George Murray to withdraw them. Over O'Sullivan's protests the Camerons were removed by Murray, who, acting on information that he had received, decided that the Jacobite attack must come from the east, not the west.